Off set snipe nose pliers with slim semi circular shaped serrated jaws. Hard wire cutting capacity 1.5mm. 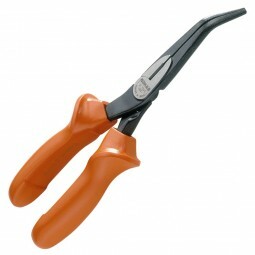 Heavy-Duty chrome vanadium side cutting pliers designed to cut hard materials. Both handles are insulated to 1000 volts and conform to CEI/IEC900, EN60900, VDE0680 specifications.